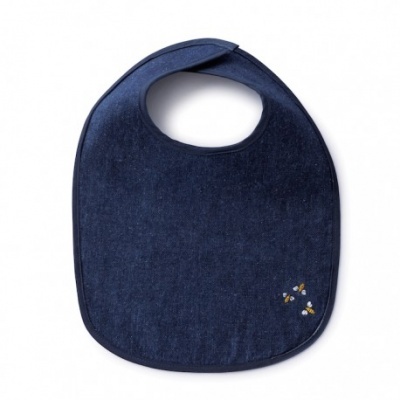 A baby bib made from a blend of hemp and certified organic cotton. 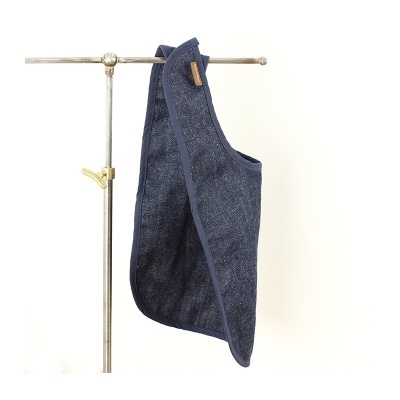 A sustainable Hemp Denim bib, a blend of hemp and certified organic cotton. 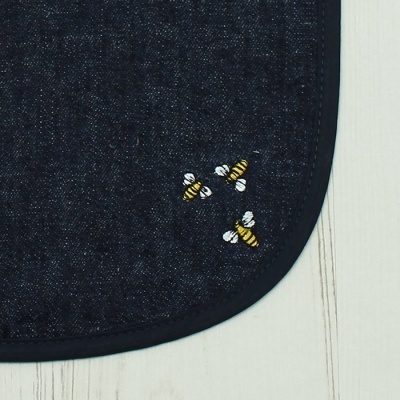 This reversible bib has a very cute bee motif embroidered onto on side. If it gets particularly mucky on the bee side it can be turned over and you have a clean side to use! Machine washable (cold, gentle cycle) and can be tumble dried. Generously sized to help protect clothing. Rolls up for storage. Comes with a smart swing tag giving details about the material used. Bambu is committed to the fair treatment of workers, promoting healthy communities and preserving the environment. Made in China by a co-operative where the craftspeople are involved in setting the pricing levels. The Hemp Denim range is produced in an environmentally friendly, vertically integrated facility using EU approved dyes, and controlled water management. Bambu are well known for their interesting materials and they are always on the look out for something new and innovative. For 2013 they have come up with Hemp Denim - a blend of hemp and certified organic cotton. It has the feel of a soft linen-like cotton and will only get better with age. Hemp has eight times the tensile strength and four times the durability of other natural fibers, and is mildew resistant and anti- microbial. It is also self-extinguishing and won't burn like cotton, or melt like synthetic fabrics. All in all an excellent yarn for kitchen and dining areas.